I DID IT!!! On September 1st 2013 I swam the English Channel in 12 hours 46 minutes and became the 14th Kiwi to ever swim The English Channel. In February 2012 a new challenge started brewing within me. 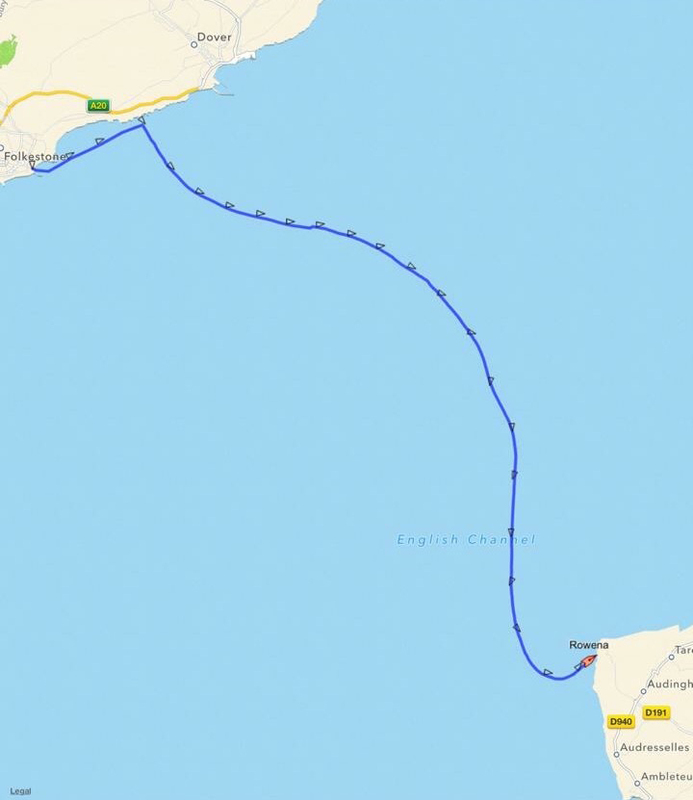 To swim The English Channel from England to France. Many, many people have asked me ‘why?’. I don’t really have a straight answer to that.one – I think it was a little bit of a mid-life crisis. I was 42 when I came up with this crazy challenge. Two – I do have a swimming background and long distance was always more interesting for me – which consisted of 1500m and 1800m! However, I hadn’t done much swimming for 20 years and had never completed an open water swim beyond 1.2kms (which I had only done once). 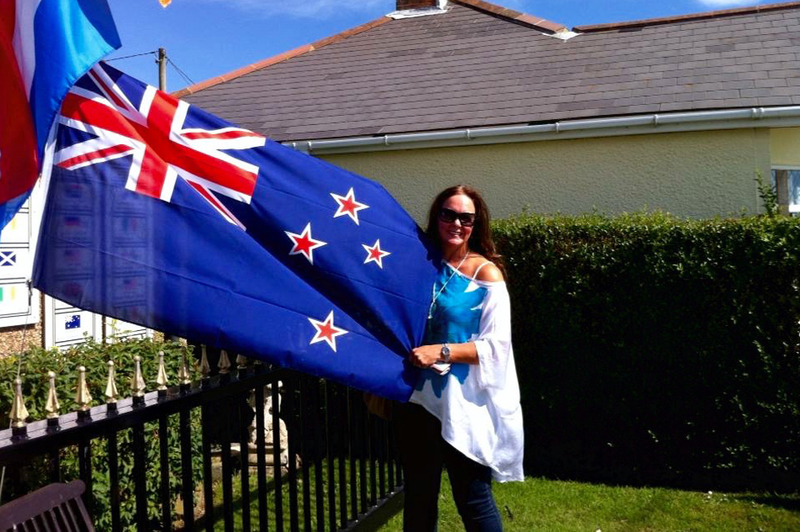 When I was younger, I had a New Zealand English Channel swimming hero – Sandra Blewitt. She swam the English Channel when I was 13. I always thought that would be something amazing to do. So perhaps it was also fulfilling my childhood dream. The next thing I did (before I started swimming) was to do lots of research and book a boat pilot. I emailed many pilots and decided upon Peter Reed and his boat Rowena. Then, I started training! I had to google where the closest training pool was where I lived in Blaricum in the Netherlands! As my training sessions progressively got longer and longer – 3-5 hours per day, six days per week – it meant that Andy would have to do the school run (amongst other things) as my training started at 7am each day. I have two boys – Connor 10 and Alexander 12 at the time. I had to also sit down with them and explain what I was training for and that I wouldn’t be as readily available. I was so lucky to have Irene Van Der Laan right from the start write programmes for me and be there for my millions of questions. 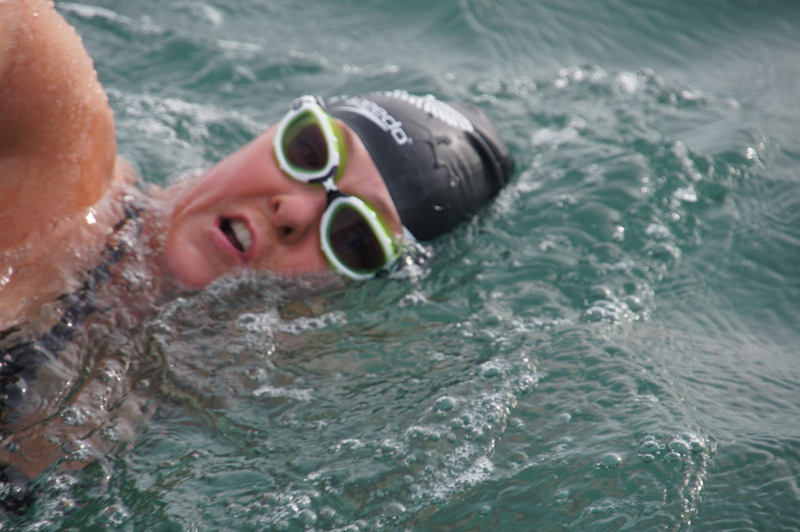 Irene has (amongst many other swims) swum The English Channel solo 2 times and also completed a double – England – France – England!! Each Sunday night she would send me six training programmes for the week. Irene did this for the love of the sport and for our growing friendship. Irene was another reason to make it to France – she had invested so much time in me – I couldn’t let her down! 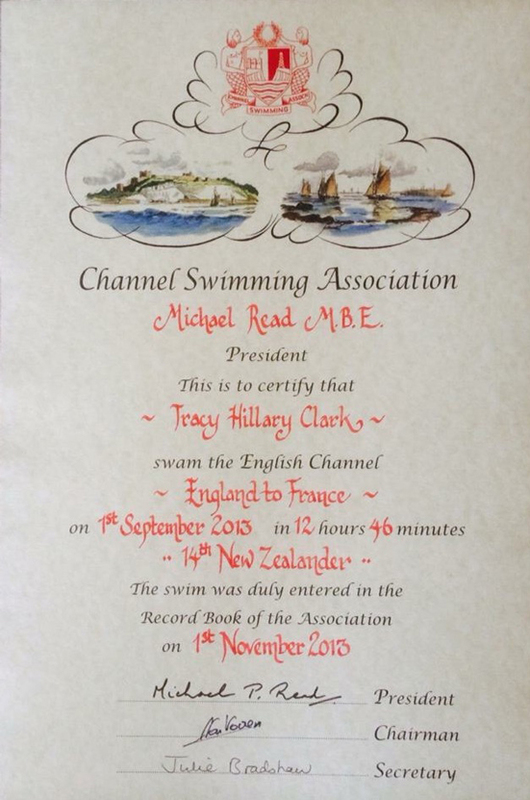 There are very strict rules associated with swimming the Channel. Firstly, no wetsuit! This meant I had to gain 10-15kgs (20-30 lbs) over the following months. Being a woman who for years has been weight conscious, this was quite a shift in my eating psyche! But I have to say, I did enjoy that part of my training immensely! You swim this solo with a support boat. You are not allowed any physical contact with anyone or touch the boat. The water is cold 15-17 degrees Celsius (59-62 degrees Fahrenheit). This meant cold showers for the next months and summer bedding throughout the winter. The heating in the car and the house was turned down low. My boys would say ‘mama, I’m cold’. I would reply ‘put a sweater on’. 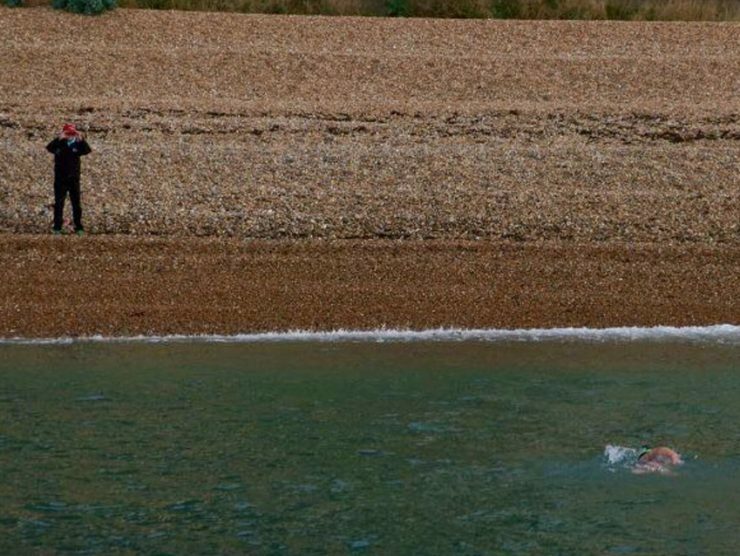 Also, only 1 in 10 people who attempt to swim The Channel make it – so the odds are not great! My training didn’t go without a hitch! Just two months into my training I smashed my shin open and cut half way through my index finger. In between both of these injuries, I was rushed to hospital for an emergency appendectomy! This kept me out of the water for a total of 8 weeks to recover. I took this down time to watch every YouTube clip and read many books about swimming the Channel – my favourite being Young Woman and the Sea by Glen Stout. During the following months we had wonderful family holidays revolving around my training. Summer 2012 was in Lake Bled, Slovenia. Christmas/New Year 2012/13 was in Fuerteventura at a Sports Resort with a 50m saltwater training pool and near the ocean, and May vacation was in Dalyan, Turkey for some outdoor ocean training and our accommodation also had a 50m training pool. It wasn’t all bad for the family! Lastly, summer 2013 I went to Loch Lomond in Scotland for a four day training boot camp in the 14/15 degrees fresh water. We then went to Zeeland in the south of the Netherlands for two weeks as a family so I could give my challenge a last training push and train in the North Sea for some salt water ocean training along with thousands (no joke) of jellyfish!!! Swimming in this jellyfish soup really helped me overcome my fear of them. This included an eight hour training swim which I handled very well. We even went out for dinner afterwards and enjoyed a few beers! 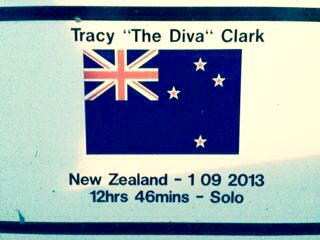 Finally, on 22nd of August, I was off to Dover and the reality of this mammoth challenge was sinking in! I had imagined this moment for months as I thought I would be incredibly nervous! To my complete surprise, I was completely calm! I knew I had done the training and I told myself – if there is something you haven’t done, it’s too late now to worry about it. Part of the challenge of swimming The Channel is waiting for the weather to behave! One of the absolute joys of waiting though, is the people you meet and the lifelong friends you make with other likeminded people. Roger Finch, Thomas Noblett, David and Evelyn (mum and dad who own Varne Ridge Channel Swimming Accommodation) just to name a few. After over a week of waiting my day came – Sunday 1st of September! Ironically my ‘window’ to swim was from 26 August to 1 September so it was my last chance to give it my everything! My boat pilots Peter Reed Senior and Peter Reed Junior were local fishermen from Folkestone (next to Dover). 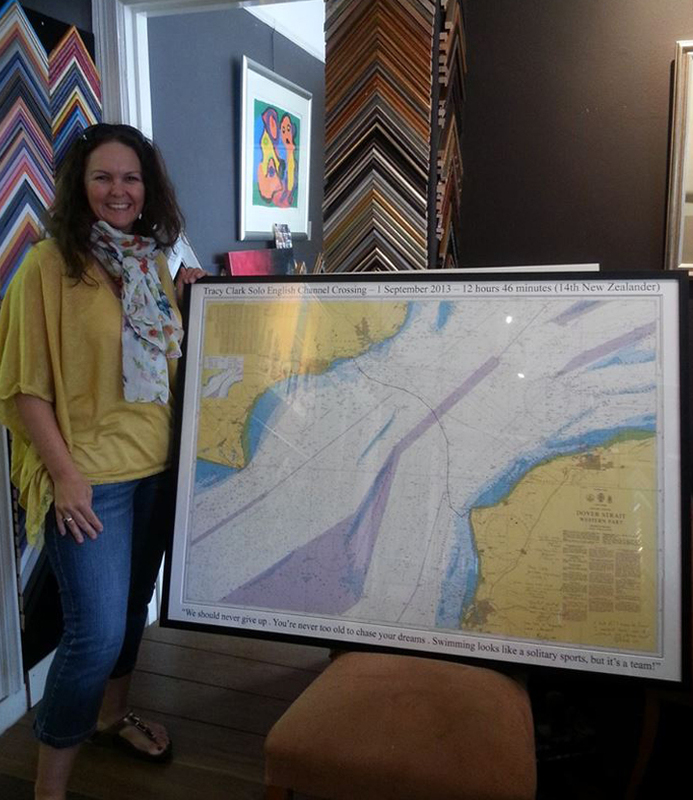 They have been taking Channel swimmers across the busiest shipping lanes in the world for over 20 years. I completely trusted them the minute I met them! My crew was made up of Andy, his brother Stuart all the way from New Zealand and my dear friend Carlota Collins. I met Carlota in the Netherlands and we became instant best friends. When I asked her to crew for me she was on board (so to speak) immediately. We met Pete and Pete at Folkestone Harbour and they took us around to Samphire Hoe Beach to start my swim at 7.34am. The boat stopped about 150 meters off the English coast. I started to swim ashore and noticed someone standing on the beach. As I started to walk out of the water, I realised it was David Dawson, a fellow Kiwi swimmer living in the UK. Dave had driven two and a half hours to do the Haka for me before I started my swim. I had tears in my eyes as this very kind gesture. I was also thinking, isn’t the Haka only for real athletes! With the end of Dave’s Haka, I have him a greasy hug, waved my arms in the air at my boat and started swimming for France! The sea was really calm and I actually had a little underwater chuckle to myself and thought this would be a piece of cake! I was taking on gels and energy drinks every half hour fed to me by a pole (feeds lasted less than 30 seconds). At my 3 ½ hour feed….I completely lost the contents of my stomach. I stopped for 5 minutes and kept being sick over and over! Out of the corner of my eye I could see the two boat pilots and the Channel Swimming Official Observer look at each other. Their faces were saying ‘she’s not going to make this’! With that, I threw my water bottle at the boat and I started swimming again telling myself over and over again ‘stopping is not an option’! I also said my boys names in my head in beat with my stroke ‘Alex, Connor, Connor, Alex’. I couldn’t let my boys down! Friends from all over the world were also following my progress on a live tracker and texting messages of support to Andy. My crew would then write these messages up on a white board so I could read them. 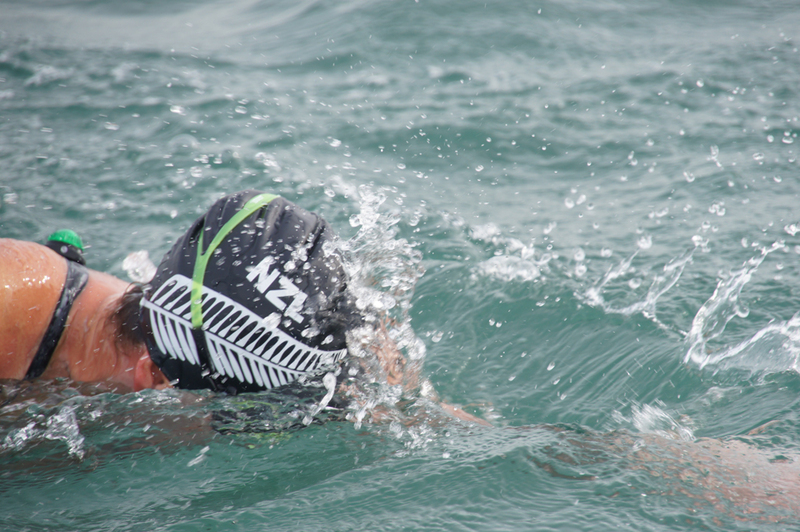 For the remainder of the swim I only ate 1 New Zealand sweet called a Pineapple Lump, ¾ of a banana and water. With about six hours to go, the weather conditions started to worsen. After two further hours we had up to two meter (6 foot+) waves in a force 6 wind! I also started getting stabbing pain in my left shoulder.. Luckily it wasn’t hurting on the pull of my stroke, only lifting it back to re-enter the water on recovery, so I wasn’t losing speed. I had two friends facing cancer – one for a third time and one for a second time. With each painful stroke I kept saying their names thousands of times in my head in beat to my stroke. If they could bravely face the horror of cancer again, I could put up with a painful shoulder! Nighttime fell! It was quite an experience being thrown around by the waves in pitch darkness! As the waves were so high I couldn’t see any coastline so I thought I had hours of swimming to go. I looked up to my support boat and I could see everyone pointing at something. One of the boat pilots was also putting the rubber rib boat in the water! 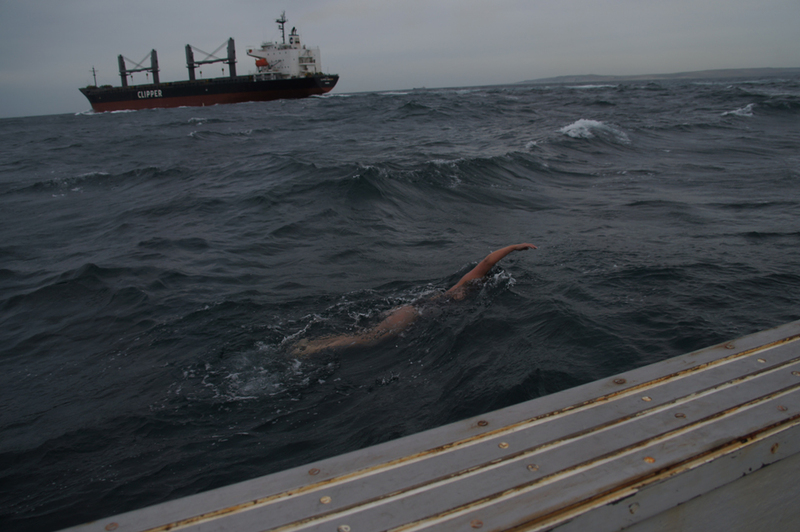 I was so afraid they were making me stop and pulling me out due to conditions, I started to swim away from the boat! Pete Junior caught up to me and shouted “what are you doing”. I said “you’re not pulling me out”. He replied “you’re nearly there, follow me”! I lifted myself high in the water and I could see the shadow of France about 500 meters away. I had to follow the small rib into shore! Pete guided me close to the rocky coastline of Cap Gris-Nez then yelled at me ‘swim in, touch the rocks, then get out of there! It’s dangerous!’. The waves were crashing against the rocks! I swam in with the waves crashing all around me. Touched the rocks and turned around and went feet first back into the waves. I remembered from being told as a youngster – never dive head first into water with rocks! I made it back to the rib boat and Pete yelled at me “GET IN”. Just at the moment, my left arm stopped working. I yelled at him “I can’t, my left arm won’t work”. With that, he reached over me and grabbed me by the bottom part of my togs and hauled me face first into the bottom of the rib boat which had a couple of inches of water in the bottom. This also caused a wedgie with my costume! 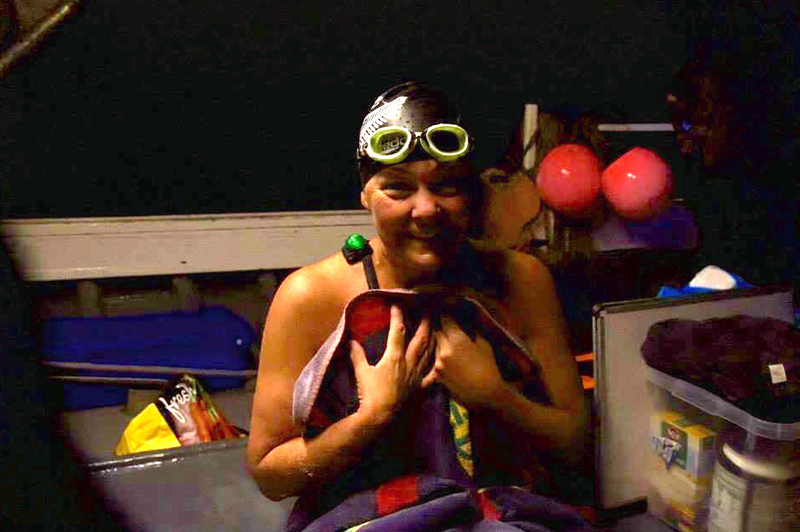 I was crying and so overwhelmed – I had just swum the English Channel and I said as much to Pete. He responded “move your leg love, we’re not out of the woods yet!” What I didn’t know was the motor on the rib boat had flooded and he was trying to row us back to the pilot boat. I was oblivious to any danger! I also didn’t know that it took nearly 15 minutes for Pete and I to find our boat. Once safely back on board I found out my time – 12 hours 46 minutes! I was overjoyed with that! What I also didn’t realise is Carlota was violently ill most of the way. I didn’t have a clue! What I do remember was her wearing a beautiful cerise pink hat and thinking – thank you my friend for bringing some colour to this grey world! On the way back to England, I cried tears of joy, kept vomiting and fainted three times – I think I was simply running on empty as I hadn’t been able to keep anything down. I was so happy and exhausted at the same time. My crew were also exhausted but overjoyed! It was as much their achievement as it was mine! Now I can call myself a Channel Swimmer! The next morning we met our two boat pilots for breakfast. I couldn’t thank them enough for their expertise but also had a burning question to ask them “it was really quite dangerous at the end of the swim, why did you take a risk and let me finish”. Pete Senior’s response was “it’s simple, we watched you give everything including your breakfast, so we had to give you everything too”! 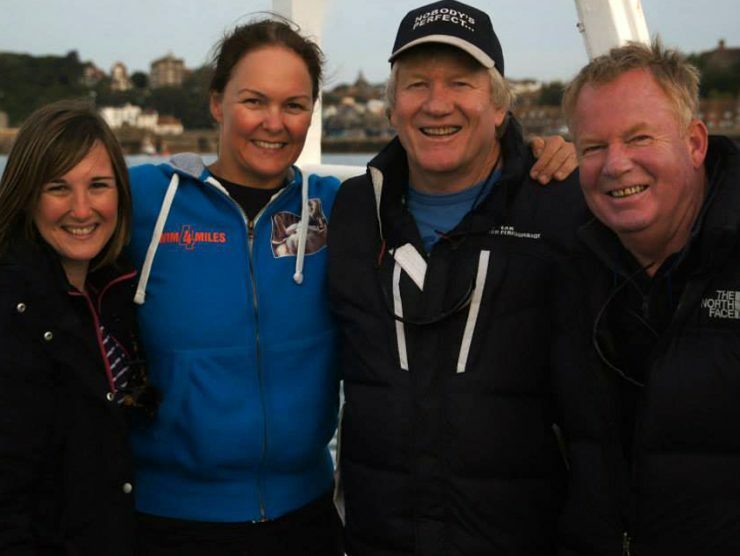 Thank you guys and special thanks to my crew – Andy my husband for supporting my dream, Stuart Clark my brother in law for travelling all the way from New Zealand and Carlota Collins who suffered severe sea sickness for my cause! That is true friendship! Swimming the English Channel didn’t open the door for my ocean swimming, it opened the world (stolen from Roger Finch)! I learnt so much about myself as a person. I always knew I was tough, swimming on an empty stomach due to profuse vomiting, tearing my left bicep tendon and swimming with that agony for what turned out to be four hours proved this to me but also how important the power of the mind is in any challenge like this. I couldn’t lift my left arm over my head for 10 months and I lost 7 kilos during that swim! My firm belief is – We should never give up, you’re never too old to chase your dreams and swimming looks like a solitary sport, but it’s definitely a team effort. I also swam for three charities – the human trafficking organisation Fairwork, Breast Cancer Research Charity, and Dalyan Dog Rehabilitation Centre based in Turkey. Together we raised 8,600 euros. My amazing crew – Carlota Collins, Andy Clark and Stuart Clark. Greasing up with Vaseline for chafing. My wonderful friend Dave Dawson performing the Haka for me on Samphire Hoe. This brought tears to my eyes. 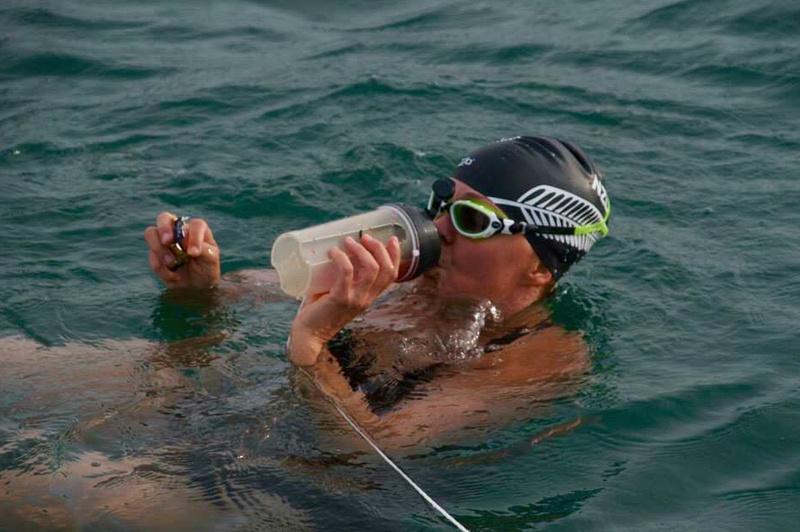 Swimming to be the 14th New Zealander to swim the English Channel. Finished after 12 hours and 46 minutes. New Zealand flag flying at Varne Ridge Channel Swimming Accommodation. Thanks Dave and Eve (Mum and Dad). 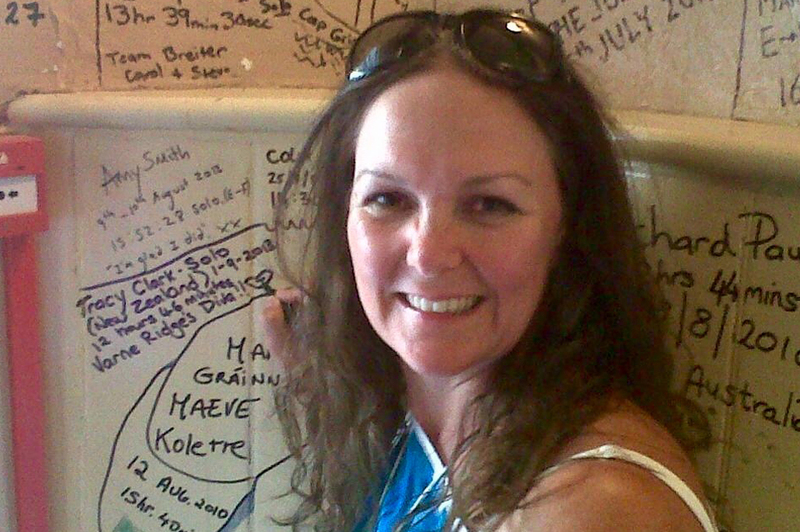 Signing the wall at the White Horse Inn, Dover. 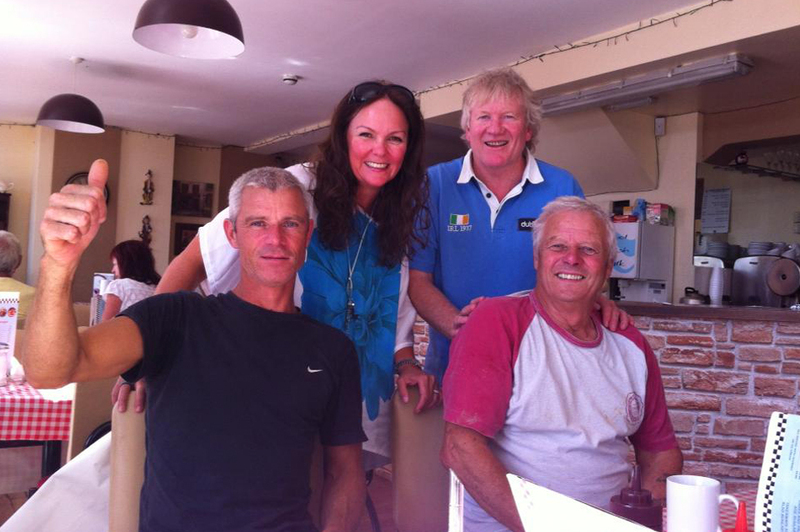 My amazing boat pilots – Peter Reed and Peter Reed Junior (boat Rowena). 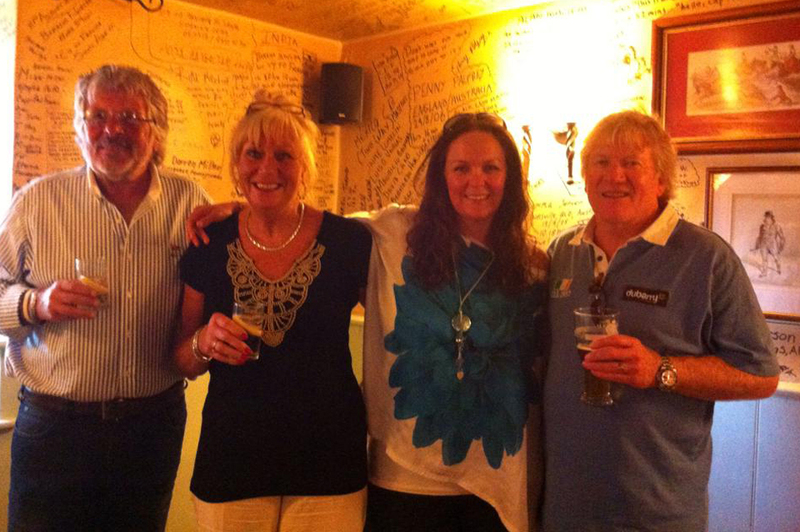 Celebrating my swim with Andy, David and Evelyn Frantzeskou (Mum and Dad). Plaque at Varne Ridge Channel Swimming Accommodation. 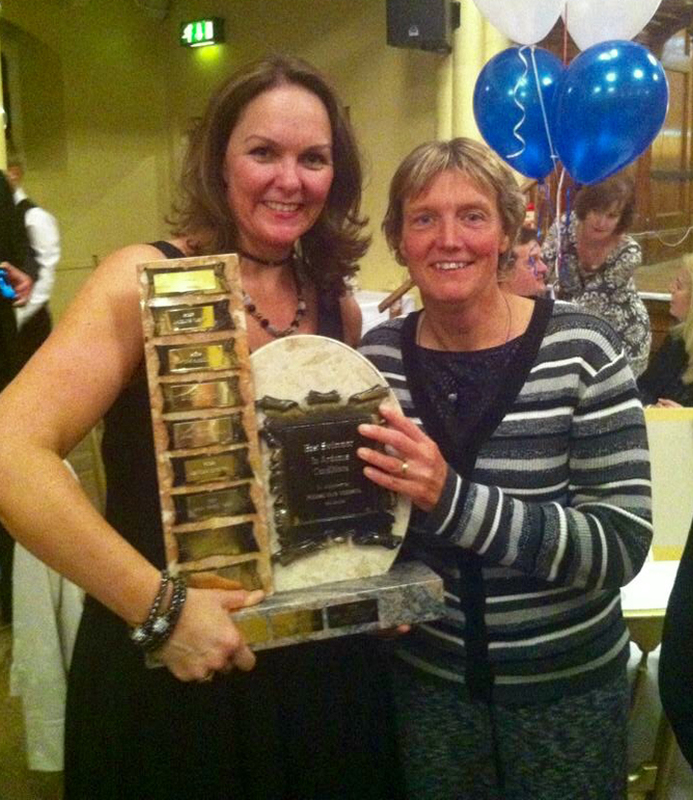 With Irene Van Der Laan (friend and coach). 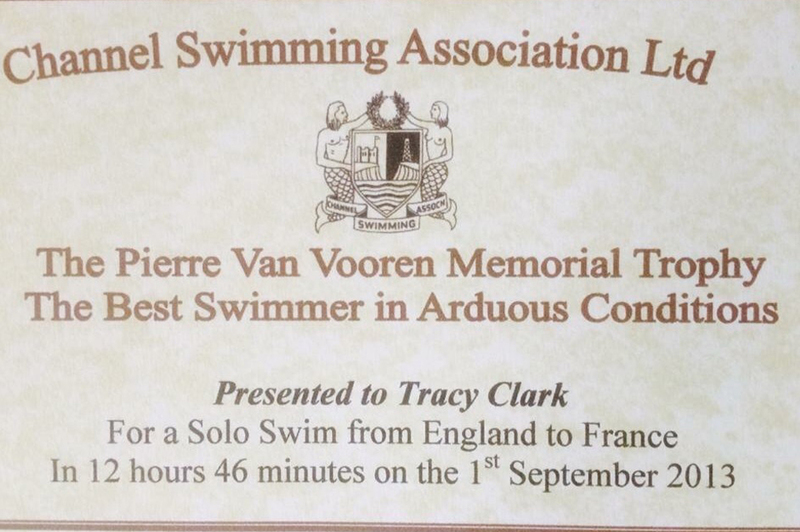 I received the trophy for swimming the English Channel in the most Arduous Conditions.